The question ‘what is the digital humanities’ is hardly new; nor is discussion of the various epistemologies of which the digital humanities are made. However, the relationship which archaeology has with the digital humanities – whatever the epistemology of either – has been curiously lacking. Perhaps this is because archaeology has such strong and independent digital traditions, and such a set of well-understood quantitative methods, that the close analysis of of those traditions – familiar to readers of Humanist, say – seem redundant. 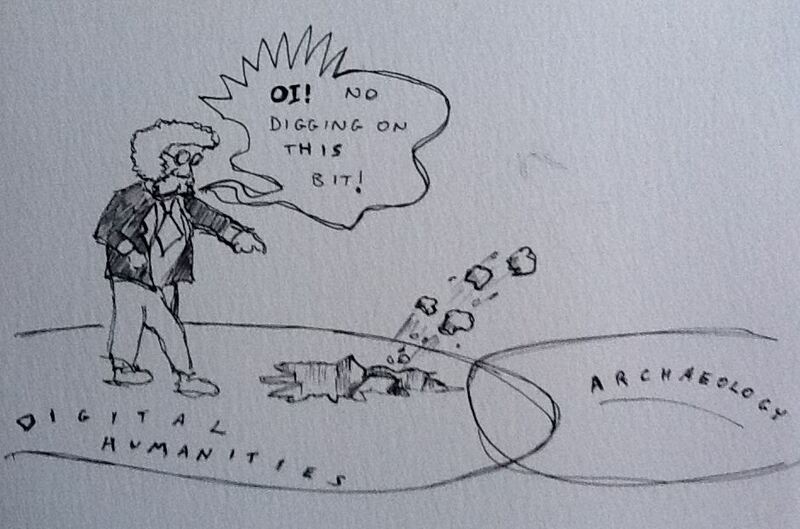 However, at the excellent CAA International conference in Southampton last week, there was a dedicated round-table session on the ‘Digital Humanities/Archaeology Venn Diagram’, in which I was a participant. This session highlighted that the situation is far more nuanced and complex that it first seems. As is so often the case with digital humanities. A Venn Diagram, of course, assumes two or more discrete groups of objects, where some objects contain the attributes of only one group, and others share attributes of multiple groups. So – assuming that one can draw a Venn loop big enough to contain the digital humanities – what objects do they share with archaeology? As I have not been the first to point out, digital humanities is mainly concerned with methods. This, indeed, was the basis of Short and McCarty’s famous diagram. The full title of CAA – Computer Applications and Quantitative Methods in Archaeology – suggests that a methodological focus is one such object shared by both groups. However unlike the digital humanities, archaeology is concerned with a well defined set of questions. Most if not all, of these questions derive from ‘what happened in the past?’. Invariably the answers lie, in turn, in a certain class of material; and indeed we refer to collectively to this class as ‘material culture’. And digital methods are a means that we use to the end of getting at the knowledge that comes from interpretation of material culture. The digital humanities have much broader shared heritage which, as well as being methodological, is also primarily textual. This fact is illustrated by the main print publication in the field being called Literary and Linguistic Computing. It is not, I think, insignificant as an indication of how things have moved on that that a much more recently (2007) founded journal has the less content-specific title Digital Humanities Quarterly. This, I suspect, is related to the reason why digitisation so often falls between the cracks in the priorities of funding agencies: there is a perception that the world of printed text is so vast that trying to add to the corpus incrementally would be like painting the Forth Bridge with a toothbrush (although this doesn’t affect my general view that the biggest enemy of mass digitisation today is not FEC or public spending cuts, but the Mauer im Kopf that form notions of data ownership and IPR). The digital humanities are facing a tension, as they always have, between variable availability of digital material, and the broad access to content that any porting over to the ‘digital’ that the word ‘humanities’ implies. As Stuart Jeffrey’s talk in the session made clear, the questions facing archaeology are more about what data archaeologists throw away: the emergence of Twitter, for example, gives an illusion of ephemerality, but every tweet adds to the increasing cloud of noise on the internet; and those charged with preserving the archaeological record in digital form must decide where where the noise ends and the record begins. There is also the question of what digital methods *do* to our data. Most scholars who call themselves ‘digital humanists’ would reject the notion that textual analysis, which begins with semantic and/or stylometric mark-up is a purely quantitative exercise; and that qualitative aspects of reading and analysis arise from, and challenge, the additional knowledge which is imparted to a text in the course of encoding by an expert. However, as a baseline, it is exactly the kind of quantitative reading of primary material which archaeology – going back to the early 1990s – characterized as reductionist and positivist. Outside the shared zone of the Venn diagram, then, must be considered the notions of positivism and reductionism: they present fundamentally different challenges to archaeological material than they do to other kinds of primary resource, certainly including text, but also, I suspect, to other kinds of ‘humanist’ material as well. A final point which emerged from the session is the disciplinary nature(s) of archaeology and the digital humanities themselves. I would like to pose the question as to why the former is often expressed as a singular noun whereas the latter is a plural. Plurality in ‘the humanities’ is taken implicitly. It conjures up notions of a holistic liberal arts education in the human condition, taking in the fruits of all the arts and sciences in which humankind has excelled over the centuries. But some humanities are surely more digital than others. Some branches of learning, such as corpus linguistics, lend themselves to quantitative analysis of their material. Others tend towards the qualitative, and need to be prefixed by correspondingly different kinds of ‘digital’. Others are still more interpretive, with their practitioners actively resisting ‘number crunching’. Therefore, instead of being satisfied with ‘The Digital Humanities’ as an awkward collective noun, maybe we could look to free ourselves of the restrictions of nomenclature by recognizing that can’t impose homogeneity, and nor should we try to. Maybe we could even extend this logic, and start thinking in terms of ‘digital archaeologies’; of branches of archaeology which require (e.g.) archiving, communication, semantic web, UGC and so on; and some which don’t require any. I can’t doubt that the richness and variety of the conference last week is the strongest argument possible for this.